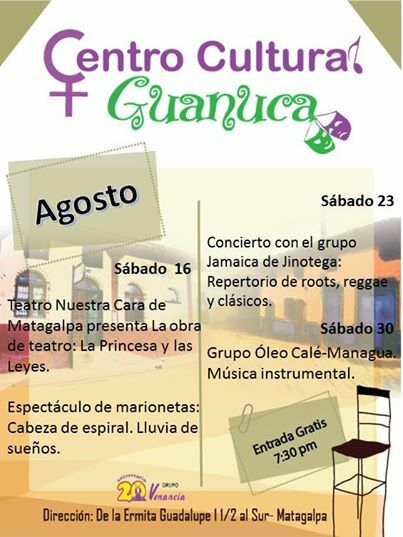 Les compartimos las actividades del Centro Cultural Guanuca correspondiente al mes de agosto. Esta entrada fue publicada en Centro Cultural Guanuca y etiquetado Noches sabatinas. Guarda el permalink. Hi Destiny,It depends on where you go. If you head for San Juan del Sur, you’ll find many peolpe speak English and there are plenty of ex-pats. But it makes sense to learn the local language if you are going to move to a new country where the main language is not English. Not learning the language of a place you choose to live will always leave you outside of the culture of your adopted new home. Just my thoughts.